UK Grindcore pioneers NAPALM DEATH have now started their massive North American tour alongside Slayer, Lamb of God, Anthrax and Testament. 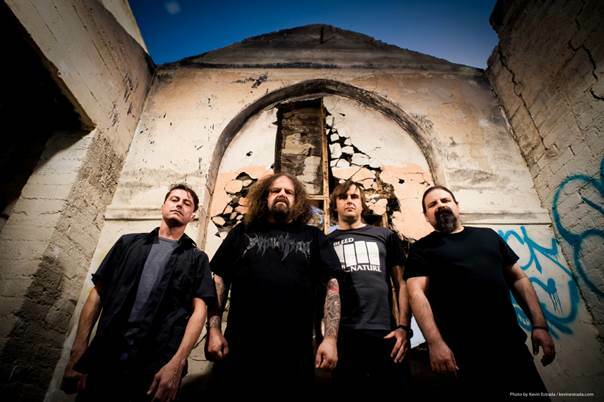 Next to the previously announced main dates, NAPALM DEATH have recently also added a string of additional shows supporting Lamb of God as well as headline dates in Europe. Following the North American tour, NAPALM DEATH will be heading to South- and Latin America with Cannibal Corpse for an entire month worth of dates and the group have now also announced another European string of shows in November as well as an appearance at Damnation Festival. NAPALM DEATH have most recently released a special compilation entitled “Coded Smears And More Uncommon Slurs” which gathers a total of 31 songs in a playing time of over 90 minutes, including rarities and exclusive earworms spanning 2004-2016 from the whirling gene pool of noise that is NAPALM DEATH. The 2LP edition of “Coded Smears And More Uncommon Slurs” doesn’t only contain a poster and an LP-booklet, but is – next to an unlimited black vinyl version – also available in the following limited coloured vinyl runs: 100x copies white vinyl (CM Webshop Europe / Sold out! ), 200x copies neon orange vinyl (CM USA), 200x copies silver vinyl (NBR) and 400x copies red vinyl (CM Distro / Sold out! ).